Li-Ning are known as the sponsor of the Chinese national badminton team. They have established a reputation for high quality badminton rackets and equipment, albeit generally more expensive than some of the better known brands. Whilst quality remains high, the marketing of these rackets to the western world is poor. It is very difficult to understand the specifications of rackets which is such a shame as I believe this is a major obstacle to a purchase. 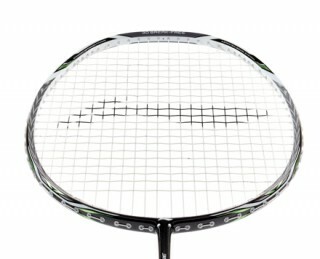 So let’s hope this review helps us understand more about the Li-Ning 90TD Badminton Racket. The 90TD arrived with the high quality full length cover in red. The green, black, white, grey colour combination looks classy with a shiny finish. This is a 3U version (85-89g) G4, larger grip, which is the standard grip size for Li-Ning rackets in Europe. The racket arrived pre-strung in NS95 so this will be an interesting test of racket and string. This appears to be an even balanced racket with medium stiff frame. 90TD has a standard size head which looks slightly rectangular and more in keeping with the isometric shape but a little more elongated. This produces a different feel for the player. Whilst I have tested a few Li-Ning rackets recently, there isn’t a benchmark Li-Ning feel, or not one that I’ve discovered yet. With this in mind, my references to other Li-Ning rackets may be limited. The racket moves really well, however it took some time to settle into hitting decent clears. Sadly the string and string tension are not too good and I would recommend a restring to breathe a lot more life into this racket. The hollow feel in the hit was definitely not a frame issue. There was very little feel and left me disappointed. But, the swing weight overall and movement through the air were good, so I know where the issue lies with this racket. Drop shots were pretty good but lacking the sharpness a good string will provide. There was too much movement on the string when employing slice to the shot. The overall feel on the frame was good it was nice to hit with a little more flex. The frame is pretty good from an aerodynamic point of view with a nice clean edge to reduce drag. Overall 90TD is not too shabby in the drop shot department. Onto the smash. Again, the frame moves well but performance wasn’t great. This review is reminding me a little of the Babolat racket I reviewed where the string was so dead it was just giving nothing to help the frame and player perform. Flat drives were quick and there is no sign of fatigue. The racket continues to move well and yet the string leaves me cold. 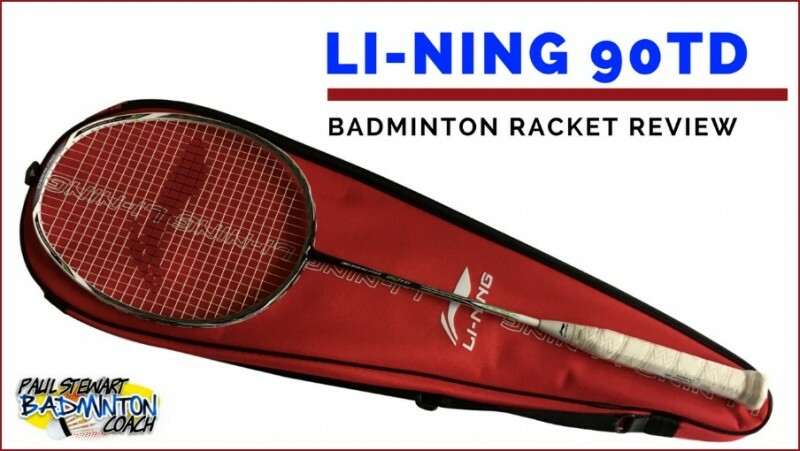 Defensively the Li-Ning 90TD badminton racket is fast to respond and there’s sufficient weight in the head to control blocks and hit through with drives or lifts. There was no sense of lag or difficulty moving my hands into position, although I would have preferred a G5 grip. Around the net 90TD was quick. There is plenty in the tank regarding intercepting shuttles and it’s easy to move into the correct position for taking shots below the net or the little acceleration required for kill opportunities. I liked this racket but the string is not great. This was one of those frustrating reviews when I wanted more and the string denied me. It would be great to test again with a better string and higher tension. It would be nice to see Li-Ning provide spare grommets for their rackets. They tend to use clear grommets and I haven’t found anywhere in the UK, Europe or Asia who sell Li-Ning grommets. Thankfully there are other companies who provide similar colours but not always a colour match. I mentioned earlier that Li-Ning marketing needs some work. I have no idea if there are any players using this racket or where it sits within the ranges. RRP is an expensive £190. Retailers are offering a range of prices so you should be able to pick one up for less than £110. This now makes this racket even more interesting and you should take note. At this price it is superb value for money, especially if you are offered a free restring which will immediately transform the racket. I believe this could be one of those rackets that steals the show. It looks great and I’m sure it can do much better than I have described here. I’ll award the Li-Ning 90TD badminton racket 4 and a half stars.